The Consumer Financial Protection Bureau has released its latest report on the various complaints the agency has received about banks, lenders, debt collectors, and other financial services. 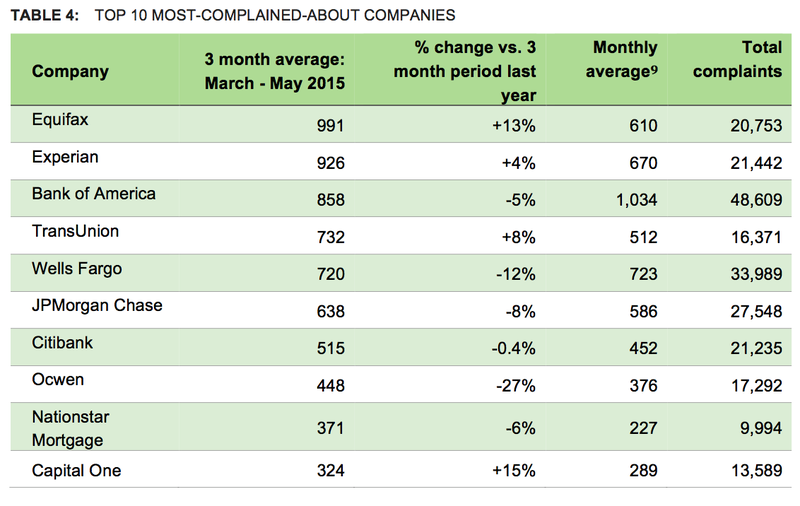 Amid a sudden increase in the number of complaints involving credit report errors, the country’s largest credit bureaus now dominate the top of the CFPB’s list of most complained-about companies. According to the CFPB report [PDF], it received nearly 6,700 complaints about credit reporting in July 2015 alone, that’s a 56% increase over the previous month and more than double the monthly average of around 3,200 for this category. And since 97% of credit reporting complaints involved the three largest credit bureaus — Experian, Equifax, and TransUnion — it’s no surprise that these companies occupied three of the top five spots on the complained-about list. Equifax topped the list, with 991 complaints in July alone, followed by 926 complaints about Experian. TransUnion managed to avoid the bronze medal in this field by coming in fourth with 732 complaints. Beating out TransUnion was Bank of America, with 858 complaints, while Wells Fargo rounded out the top five with 720 gripes filed against it. Most complaints (77%) filed against the credit bureau involve people trying to dispute incorrect information on their reports. “Consumers frequently complain of debts already paid or debts not yet due showing up on their report, negatively affecting their credit scores,” reads the report. There is also the issue of access to credit reports. In order to minimize fraudulent access, the bureaus use identity authentication questions that even the person they’re about might not have the answer to. Do you know every street address your mother has lived on? Do you remember every phone number you’ve had at every place you’ve lived? If not, you might not be able to prove you are the person you claim to be. In terms of the two banks in the CFPB’s top five, consumers are frequently complaining about mortgage-related issues with both BofA and Wells Fargo. The two banks also saw quite a lot of complaints about their regular bank accounts and related services. Bank of America was also the subject of a not-insignificant number of credit card complaints. Since the CFPB first began accepting complaints through its online portals, more than 48,600 have been filed against BofA. Wells Fargo is a distant second with nearly 34,000, followed by JPMorgan Chase at around 27,500. 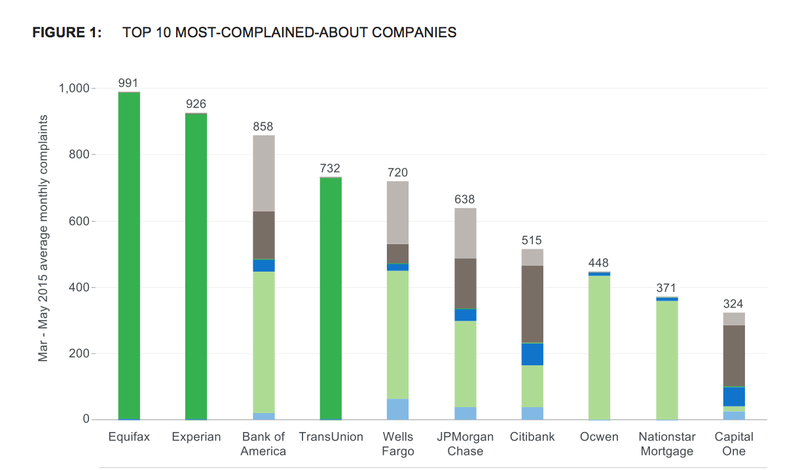 But for all this talk of most complained-about companies, none of them are in the most complained-about category: debt collection. In July, the CFPB received a whopping 8,224 complaints about debt collectors, representing nearly one-third of all complaints filed with the bureau. But since this industry is so varied, no one company receives enough to penetrate the ranks of the credit bureaus or big banks. CFPB Launches Monthly Reports To Showcase Financial Difficulties In Specific Areas Of The U.S.